Botanical Name: 1. Vitex trifolia L. var. simplicifolia cham; 2. Vitex trifolia L.
Common Name: Vitex fruit, Chastetree fruit. Part Used & Method for Pharmaceutical Preparations: The fruit is gathered in summer, dried in the shade and baked until yellow or black. 1. Headache and unilateral headache due to invasion by exogenous wind and heat. 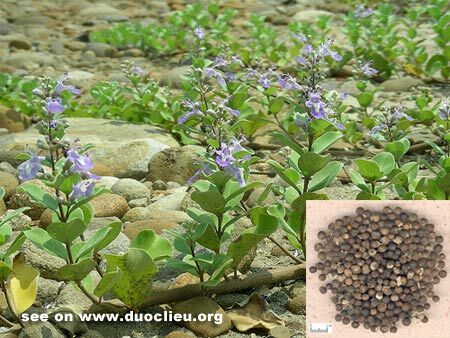 Chastetree fruit (Manjingzi) is used with Ledebouriella root (Fangfeng), Chrysanthemum flower (Juhua) and Chuanxiong rhizome (Chuanxiong). 2. Upper disturbance of liver-yang manifested as red, painful and swelling eyes, excessive tearing, dizziness and blurred vision. Chastetree fruit (Manjingzi) is used with Chrysanthemum flower (Juhua), Cicada slough (Chantui) and Tribulus fruit (Baijili). 3. Wind-damp bi syndrome manifested as joint pain and cramping or heaviness of limbs. Chastetree fruit (Manjingzi) is used with Ledebouriella root (Fangfeng), Large-leaf gentian root (Qinjiao) and Chaenomeles fruit (Mugua).